Believe me, I know how it feels! You are on holiday – for two weeks or two days, it doesn’t really matter – and want to build some life-long memories by exploring the place. Even if you agree with your significant other as to what you want to see and do together, your toddler has completely different ideas to you two and spends the day following their own agenda which includes temper tantrums, several snack times and an inability to pass by a park without stopping for an hour or two. At the end of the day you feel shattered after all the running around, disappointed that you didn’t manage to see that particular thing which was top of your travel wish list and, dare you admit it, slightly disillusioned remembering all those holidays pre-family obligations when you had all the time in the world to do exactly what you wanted and how you pleased. Unlike a baby who, if fed, clean and comfortable, would be quite happy to be taken exploring a new city, a toddler has limitless energy to burn and needs to be stimulated and engaged, all the while ensuring their safety. A toddler sees the large rooms of a museum as an excellent place to run and touch things and, if bored, tired or hungry, they won’t be shy to let everyone around know it by screaming, squealing or even throwing themselves on the floor. It would be unfair to expect a toddler to accompany you on day-long sightseeing trips visiting a string of places which require them to spend long stretches of time strapped in their buggy or surrounded by a huge and pushy crowd. Your toddler will quite happily exchange all the art in the world for a nice little playground where they can spend half an hour on the swings and the slides. Don’t despair though! Being a parent doesn’t preclude you from experiencing the places you travel to in the best possible way and enjoying some first class sightseeing. Here are five tips to help you do just this. They are based on my own experiences travelling with a very active toddler, most recently on a 45-day long journey across Europe taking in seven countries. Read on and let me know what you think in the comments below. 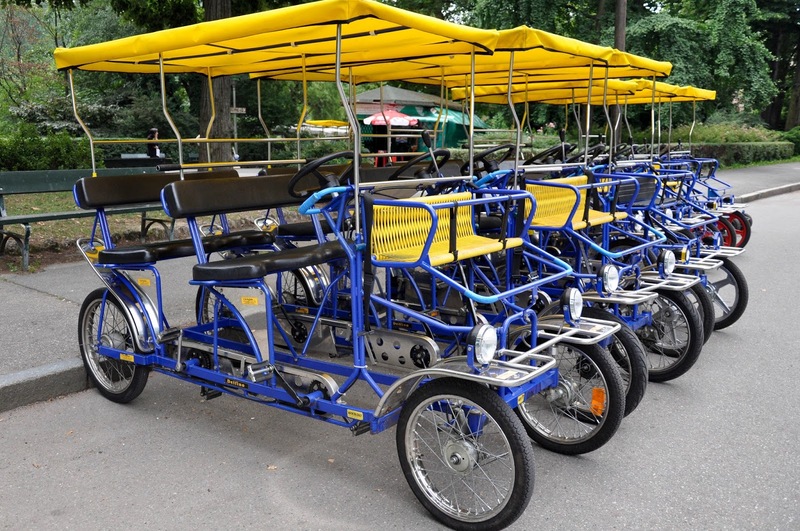 When planning your sightseeing during a forthcoming holiday or trip, think of your family unit as a tandem. You need to cycle in unison in order to get anywhere. If one of you starts pulling in one direction, whilst the other one heads for the opposite way, you will not make any progress. Choose activities which would be of interest to everyone in your little party. It may sound impossible to find things which would excite mum, dad and toddler in equal measures, but it is achievable. Check the website of the local tourist information centre for toddler-appropriate museums and activities. Most tourist boards nowadays publish sightseeing plans and itineraries aimed specifically at certain age groups. Scroll through these for ideas. Make a note of the places which sound good. Hands-on museums, open-air exhibition spaces, medieval villages, zoos, amusement parks, green parks, water-related entertainment are usually a good first choice, as they will provide your little one with lots to do and see, will keep them engaged and even give them a chance to run around and blow off some steam. In case you are interested in a more ‘grown-up’ museum, call them in advance to ask if they have a dedicated play space. You will be surprised how many museums nowadays have one so that parents can take turns to quietly explore the exhibits whilst keeping an eye on their happy toddler making puzzles and scribbling with crayons in the play room. True Story: The incredible Tyrolean Folk Art Museum in Innsbruck, Austria, was high on our wish list, but its displays were not really that suitable for a toddler. Fortunately the museum had a large play space with puzzles, games and soft carpets and furniture for kids to play in plus a great craft studio for older children to do crafts. So, we took turns. First I had a good look around the two floors of amazing exhibits, whilst my husband watched over our child. Then, we swapped. All three of us had a very enjoyable time! For best results, try to structure your day around your toddler’s usual routine. Have a nice and relaxing breakfast as a family, then tick off the places with the most activities for your child. This could be a high-energy visit to an amusement park, a walk in a famous green park or an educational exploration in a hands-on interactive museum popular with children. Give your little toddler the chance to run around and discover the world for themselves. A park with fountains and water features in which they can splash is always a great idea. A museum where they can touch the displays and learn something new will stimulate their development. At lunch time try to avoid busy eateries, as you don’t want the noise and commotion of a large crowd to overstimulate your tired toddler. Have a picnic instead or choose a small cafe with a quick service. After that your toddler will be ready for a nice little snooze in their buggy. This is just the right time for you to either take a little breather yourself or go and tick off those places on your travel wish list which will be of no interest to a toddler. In the late afternoon, you can all have a little treat as a family discovering local patisseries and delicacies and then enjoy a relaxed evening and an early night in to give a chance to everyone to relax and recuperate. True Story: When in Turin – Italy’s former capital – we had an active morning exploring the Medieval Village in the leafy Parco del Valentino, which was a hit with our toddler who loved running down its cobbled lanes and splashing in its water features. In the afternoon, whilst she was asleep in her buggy, we visited the world famous Egyptian Museum and were able to enjoy the splendid exhibition without having to worry about chasing after an inquisitive toddler who likes touching the displays. No matter how many visits to fun places you schedule during your holidays and your travels, try to set an hour or two aside every now and then for some proper play at a playground or soft play centre. Your toddler will appreciate the opportunity to simply run around, go down slides and enjoy the swings without the learning environment of museums or the full-on fun amusement parks offer. This unstructured play time will give you a chance to reconnect with your toddler, give them your undivided attention and make the new city that you explore together seem more like home. You may also have a chance to chat to local mums and dads entertaining their children at the playground and thus get some first-hand recommendations for even more kid-friendly activities which you may have otherwise missed. True Story: We try to discover a local playground in every new city we visit. Even half an hour spent there gives our toddler so much joy. We have been to playgrounds just outside medieval defensive walls, overlooking castles, bordering on rivers and overlooking the Alps. We have also chatted to parents from all over Europe and further afield sharing from simple hellos to in-depth conversations about children and travelling. When you are out and about exploring a new city or even a whole country day after day, you don’t want to be carrying around too much so as to be able to move swiftly from one point of interest to the next. Still, in order to make your sightseeing with a toddler a smooth operation, there are several items which you need on a regular basis. The secret to have all that you need with you without actually dragging piles of luggage is to be very clear about what essential items you can’t do without and to have the right frame to support them all together with your child. As such, your most important item would be a good buggy, which is comfortable enough for your toddler to be able to nap in, sturdy so that you can hang a changing bag and any other bags that you may carry on it and at the same time light, versatile and not too expensive, so that you can easily take it onto public transport, wheel it around old medieval towns, push it across museums and don’t fret too much about it getting slightly chipped and battered with all the walking and sightseeing you have in store for it. Add to it a changing bag with all the usual necessities packed in it: nappies, changing mats, suncream, a change or two of clothes, a hat, a favourite toy, a jacket if the weather suddenly gets cold in summer, a blanket and everything and anything else you know your toddler really needs. Don’t forget to add to this several snacks and water, as sightseeing can be exhaustive and energy levels need to be kept up, especially when in an unknown city where finding the right cafe or a supermarket may require some extra time. True Story: Even though we were in Turin in June and the weather was really hot, we knew we had been right to drag a blanket with us when our toddler, exhausted from a morning of running around, fell asleep and the Egyptian Museum we visited while she was napping in her buggy felt positively chilly with the air con turned up to the max. With regards to the buggy, before leaving for our trip across Europe this summer, we bought a lightweight and cheap telescopic buggy which not only took minimum space in the car, but it was also very easy to unfold and our child found it comfortable to sleep in. Pace yourself! There will be places and attractions at your destination which you will just have to miss. Be it because they wouldn’t be appropriate for a toddler or because you are all so tired that you can’t muster the energy for yet another museum, amusement park or another recreational activity. Keep an eye on your toddler and if you are holidaying at the same place for a week or two, take a couple of afternoon off for you all to simply sleep and re-charge. If you are only visiting a place for a day, don’t fret about all the sights you can’t cram in your schedule, but focus on enjoying the ones you are able to visit. Better spend time with your little one, letting them absorb at their own pace the wonderful new world you reveal right before their eyes, than to drag a tired and teary toddler from one place to the next just so as to cover everything that is even vaguely mentioned in your travel guide. True Story: When we visited Neuschwanstein Castle in Bavaria we made a conscious decision not to explore the nearby Museum of the Bavarian Kings and Hohenschwangau Castle. At that point we had been on the road for days and we needed to have the afternoon off for our toddler to relax and play. On one hand, yes, it was a bit disappointing, but on the other it felt good because we did what was right for our child. this list based on your own experiences travelling with a toddler.